Copper is one of the most widely used metals in the construction industry. Copper brazing refers to the welding of joints at high temperatures. The method is often used by engineers as an alternative to welding when temperatures above 850 degrees are being used for soldering purposes. There are many benefits to using copper brazing for joint melding work. For example, they protect against fires that are present near the joints and raise the temperature. They are also better suited for air conditioning and refrigeration purposes. Not to mention, they work better for fuel gas distribution systems. Water supply tankers and reservoirs also do not corrode joints melded using copper brazing. There are certain points that should be kept in mind when preparing to braze copper. A slightly carburizing flame should be used and proper fluxes are essential when using silver brazing alloys. Lap joints work best with an annealed copper brazed joint. Both oxygen free and oxygen bearing copper can be used for brazing work. 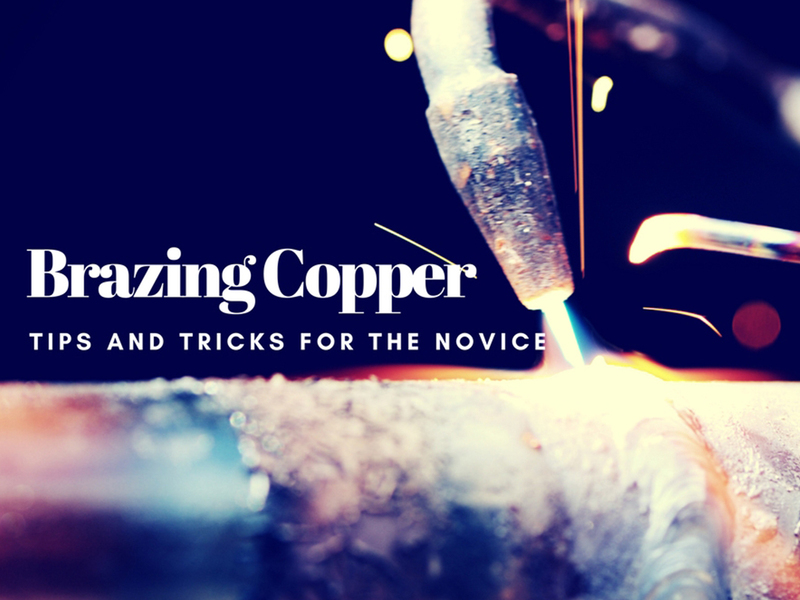 Hot Tips for Copper Brazing! The clearance for allowing filler metal penetration in small to medium diameter pipes should not be more than 0.002 to 0.003 inches. For large diameter pipes, clearance should not exceed 0.008 to 0.100 inches. For forming the joints, there are two methods that can be used. You can insert the filler metal in the joint recess or you can feed in the filler metal from the outside after heating the joint up to the right temperature. Keep in mind that a scarf joint can be used for forming joints where double thickness is not a desired trait for the lap. – Not allowing enough clearance for the filler metal to form a joint between the base metals. – Using unclean metal surfaces for forming the joint. – Using the wrong flux composition that is not a good fit for the metals being used. – Not covering the surface area with flux completely before starting the brazing process. – Assembling the joints in the wrong position with faulty alignment for the brazing process. – Not removing the flux residue after the brazing process is complete, which can lead to weakened joints since the flux material is potentially corrosive. – While calculating the proper clearance for two different metals, keep in mind the different expansion rates for both of them and factor it into the calculations. – Capillary action, which is the basis for the brazing action, does not work as well on unclean surfaces. If the surface contains oils, dirt particles, or similar residue, the filler metal will be unable to stick, and the joint will fall apart. So make sure the surfaces are clean, and free of any residue. Solvents can be used to remove oil stains, while oxides can be removed using the abrasive action of an emery cloth. – There are some cases where flux is not required for brazing. This includes copper to copper joints, as well as assemblies that are joined together in a controlled atmosphere, which contains a gaseous mixture in a closed space. The absence of oxygen in the enclosed atmosphere ensures oxidation does not take place on the joint surface. – The best way to hold parts together for brazing is by using gravity. Adding additional weights to the structure can also make it more secure. Using a support fixture can also make the process of brazing easier. – The fixture should have the least mass possible along with the most basic design necessary. It should also have the least amount of contact possible with the parts of assembly. The material used to create the mixture should be able to withstand the high temperatures it will be exposed to during the brazing process. Once the actual brazing starts, pay close attention to the flux. If the color changes in a uniform fashion, it means that the parts have heated evenly. – Care should be taken to deposit the filler metal immediately next to the joint, so that the material does not spread out over the plate, but flows directly into the joint. – If the assembled parts overheat during the brazing process, the flux becomes saturated with oxides, and the color turns green or black. In such cases, use a mild acid solution to clear out the flux. For more tips and tricks about your favorite metallurgical processes, head on over to NTT. There is an on-site course available on Brazing for HVAC which includes working with copper. Discover thorough courses and seminars on all the topics you wish to explore, and find guidance under industry leaders and experts from every field! For more information about National Technology Transfer or any of our programs visit our Website or view our complete Training Schedule.